These TV Stands Have Multiple Components To Create an Intriguing Trade Show Booth! These TV Stands That Fit 32" TVs Are Perfect for Company Promotions! TVStandsOnly.com Stocks Them Online! Tradeshow exhibits include a table cover with custom text design (no graphics), available to ship in 24 hours! Folding table has locking legs for extra stability to any environment. Tradeshow exhibits feature TV stands that hold 32" to 60" televisions weighing up to 110 lbs. 8' Pop-up display is hook and loop receptive to many different marketing accessories promoting services available at your booth. These TV stands that fit 32" TVs have a pop-up frame with black hook and loop fabric to hold many styles of accessories. Graphic holders and literature racks attach to the unit to entice passersby with marketing materials. The TV stands have a carrying case included, which disassembles for transport. The case then serves as a greeting counter as patrons enter the booth! These TV stands have (2) television stands included that can hold a 32" to 60" plasma, LCD, or LED TV, weighing up to 110 lbs. The adjustable height stands range from 44" to 71-1/2" in height in (7) incremental positions, creating an effective marketing display. 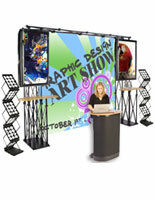 Trade show booths, exhibition stands, and other TV stands also use a large television shelf on these stands. This shelf is perfect for placing TV peripherals for running a multimedia promotion on your Samsung, Toshiba, or other TV from within your booth. The trade show displays, TV stands also feature a printed table cover with a custom text design (no graphics) and 24-hour printing. The black fabric has a choice of (15) colors of text to create your phrase. These TV stands have a text design (no graphics) cover that is designed to fit 6' x 30" x 30" tables. This cover will fall 2" from the floor on all sides. 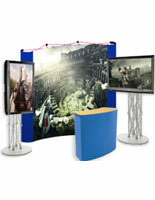 The folding table is also included with this trade show display. The table has locking legs for stability, as well as a handle to easily carry the unit to and from different marketing events. 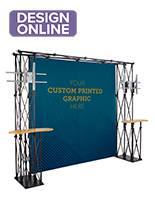 These portable trade show displays make an impression on patrons, and help garner your business's booth more attention. 96.0" x 88.0" x 13.0"